Winter term is progressing quickly, and winter athletic seasons are in the final stretch. Girls and boys varsity hockey is heading into the final three weeks of games and tournaments. Both teams are playing well and have had some impressive late season wins. Boys and girls track has three more weeks of meets and the end of the season regional and state tournaments. They are working on both team and individual goals. Boys and girls basketball have one more week of regular season action, and both teams are currently well positioned for post-season berths and hope to punch a ticket to the tournament at the Augusta Civic Center. Middle School teams are in the final stretch of their seasons, competing in hockey and basketball. There is still time to support the Panthers. Schedules and locations may be found on our website. The teams love to have fans in the stands. Thanks to the Studio Band! If you were at the NYA vs. Hebron boys hockey game on Wednesday, you were treated to an exceptional performance by the NYA Studio Band decked out in their NYA gear. This group is highly entertaining, and you never know where they might show up. I hope they are able to make a trip to Augusta to support the basketball teams in the playoffs. It was a terrific show of school spirit. Lower School students are busy preparing for the Lower School Arts Celebration on February 27. This year’s theme is Africa. The students will perform and display their amazing artwork during the celebration. This year, Lower School students are also participating in Joseph and The Amazing Technicolor Dreamcoat as part of the children’s choir. They will join the Middle and Upper School students in this production. The students have been busy working on the play, and performance times are as follows: Friday, February 8 at 6:30 p.m., and Saturday, February 9 at 2:00 and 6:30 p.m. All shows are in Safford. Admission is $8.00, and tickets can be reserved by emailing Heidi Lathrop. Our winter musical is always a great show. Thank you to our directors, Nora Krainis and Linda Vaillancourt, along with our talented cast and crew. The show is fun and appropriate for all ages. The Upper School Environmental Club is reaching out to the Lower School students. This week, the club gave an interactive presentation to the students on sustainability, recycling, and environmental awareness. Thank you to the Environmental Club for taking the time to serve as role models for the Lower School students. You may know that NYA currently has 19 students from other countries or states that require host families. Many of these hosts are current or former NYA families. Faculty are also serving as host parents. These students contribute a great deal to our community, and we are fortunate to have them. If you are interested in learning more about hosting a student from another state or country, please contact Sagaree Sengupta or Eliot Grady. They can provide information on the program, the host family stipend, and additional expectations of the program. We are also looking for families to serve as host “aunts and uncles.” Host “aunts and uncles” are available, at their convenience, to provide occasional/weekend relief for the host families. This is a great opportunity for a cultural experience and a great way to support a NYA student who is living away from their home. Volunteer to help with the NYA Soirée: Join us on Wednesday, February 13 from 2:00 to 2:30 pm in the Middle School Community Room to share your thoughts and ideas on the Soirée, NYA’s biggest fundraising event of the year. We would love to hear from you. 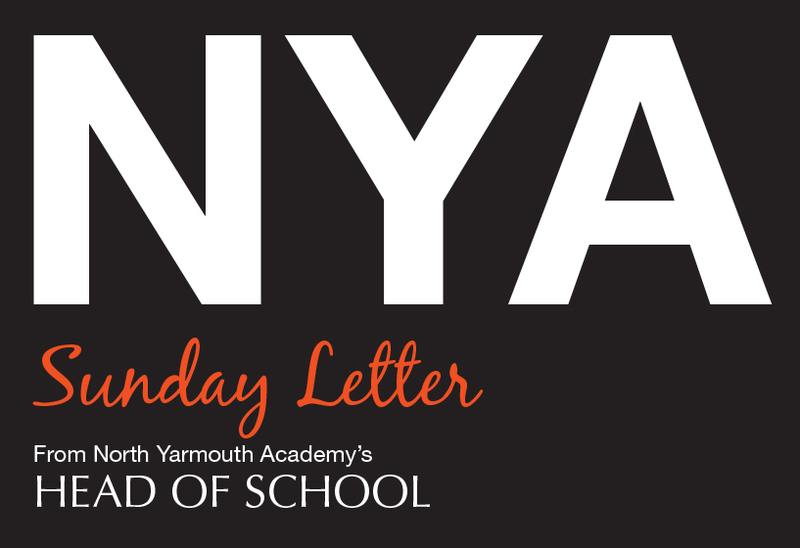 If you have questions, please contact event chairpersons Josie Griffin P’27, P’30; Jen Edwards P’30, P’32; Gretchen Lacombe P’22, P’25; and Amity Jackson P’21, P’22, P’26; or Crystal Gordon in the NYA Development Office. Kauffmann Program Opportunity: Applications are open for the 2019 NYA Leadership Academy, which will take place on August 12 to 16! In this summer program, rising seventh and eighth grade NYA students hike for five days across New Hampshire’s High Peaks while learning about and practicing leadership. The program is led by Kauffmann Director, Ian Ramsey, and MS Experiential Education Director, Danielle Barschdorf. Here is additional information on this amazing opportunity for our students. If the weather outside looks questionable for driving, and you have not received a text message from NYA about a delay or cancellation, please be sure to check your email, Facebook, my Instagram account, and/or Newscenter 6 just in case our text messaging system is down. This does not happen often, but it has happened before. If you don’t receive texts from NYA and you would like to, just text START to 22383 and add 22383 as a contact in your phone’s address book. In addition, please update your information in Family Web using the Custodial Parent Information Form to ensure that your cell phone number is correct and your Parent Alert settings are set to receive text messages. Further instructions can be found here. On Tuesday, February 12, the ninth-grade class will board the Amtrak Downeaster for Boston’s Museum of Fine Arts and other activities. As part of their studies in English and History classes, students will examine the permanent exhibits of Ancient Greek, Roman, and Chinese artifacts at the museum. They will also have a chance to see the work of legendary photographer Ansel Adams and the restoration of Japanese Buddhist statues in two temporary exhibits. Afterwards, students will break into small groups and explore Boston with chaperones. Activities may include visiting other museums, the Boston Common, and popular shopping areas. The day trip wraps up with dinner at historic Faneuil Hall before boarding the train back home. Parents and students will receive an informative email very soon. If you have any questions, please email Dave Gagne or Heidi Grant. Reenrollment agreements were sent on Friday. Please do not hesitate to reach out to Mr. Austin, Mrs. Markonish, or me if you have any questions regarding the program for next year. As a reminder, please return your agreements in a timely manner for two reasons. Some classes are at or near capacity, and in order to reserve your spot in class, we need agreements returned no later than March 1. In addition, a timely return of agreements allows the school to develop an accurate enrollment profile. This is important as it influences staffing needs and program decisions for the upcoming school year. Go Patriots! Have a great week.